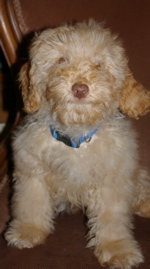 Our labradoodle puppy arrives and we are all so excited to see fluffy for the first time. 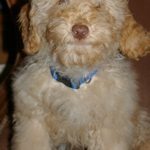 Here are some helpful labradoodle training hints for kids. "A dog teaches a boy fidelity, perseverance and to turn around three times before lying down"
You Wanted A puppy Now Look After Him! There are children who were born on a farm and who rise at 5 am to milk the cows and feed the horses without a word of complaint. 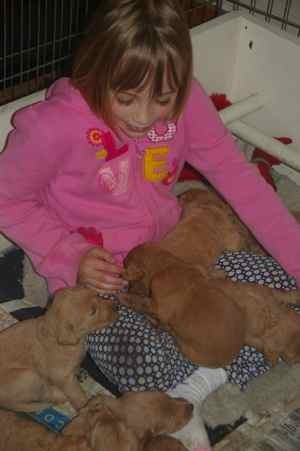 Unless your child is one of them you will most likely have to be involved in puppy’s care. See puppy care as a bonding time with your kids as well as the dog. Feed the puppy, train the puppy, clean up the occasional accident and walk the puppy together. You’ll all be happy and eventually everybody will do these necessary puppy duties not just mum or dad. A puppy does take time and attention. If you think work, soccer practice and skating will make life so busy that puppy is just hurriedly squeezed in as you rush out the door almost every day perhaps this isn’t the right time for puppy to arrive in your life. When you add a puppy to the family what you want is more wags and fewer barks. You don’t want poor Fluffy to be the subject of family arguments or the job of one, overworked parent. To make sure your new puppy and the kids get off on the right paw together we have a few helpful thoughts. A young child makes a great playmate but not always the best baby sitter. Driven by their natural curiosity even the sweetest of children can poke or prod a puppy into an eventual episode of fear and growly behavior. Young children and puppies should be supervised. The puppy who jumps all over the four year old or gets mud on your new outfit is never a hit. When puppy jumps up we usually react in a big way by yelling and flapping our arms about. Puppy is thrilled. She has humans who really know how to have a good time. When puppies jump all over the kids have them be very still like trees. Kids are very good at this. They ignore the puppy, put their hands at their sides and stare at the ceiling. How boring for the poor pup who was having such a good time only a moment ago. As soon as the puppy settles we like to give puppy a kibble first as she sits quietly and then the game can begin The game should be one the children enjoy as much as the puppy like chasing a ball or running as fast as they can. When your child wants to begin interacting with the puppy have him call puppy and then give him a kibble. We taught puppies to sit for their kibble and if children continue the game puppy will sit nicely rather than jumping all over the child and scaring him. Puppies nip. A good thing about staying with mum for a long period of time is that mum teaches puppy that no means no. At that stage she is a better teacher than we are. Nipping is initially a good thing because it teaches bite inhibition. The puppy who has never nipped and had a response has no idea how hard he is biting. When the puppy nips at children even if it doesn’t hurt have your child yell in pain and then be very still, just like the tree. Puppy will learn nipping is painful to those wimpy humans and the game stops. Children like to play with puppies. Have them use a tug toy instead of their clothes or fingers. All of us have heard people warn to stay away from Fluffy when she is eating or heard a dog growl a warning when you get close to his dish. This is a rather anti-social behaviour and can be dangerous if a two year old stumbles by when Rex is eating his kibble and liver. Dr. Ian Dunbar, dog behaviourist, had an excellent suggestion for we puppy families. Try your best to find a child. Give the child tiny bits of steak or chicken or some other delicious food. Give Rex his dinner and let the child sit beside him. Have the child pop a bit of the delicious morsel into his dish every once and a while. Rex will soon begin to view dinner interruptions as a wonderful thing. When the puppy is young interrupt meal time often with something really good and puppy will be very relaxed around humans when he eats. Find a dog class that has a philosophy that makes sense to you and that welcomes kids. Many dog training schools have classes designed for kids and puppies, others have classes for everybody but welcome kids. We like Ian Dunbar’s, positive reward training ourselves and there are many classes that use his philosophy. Register puppy as soon as you can. The family should love the classes. If you don’t find another. It is what you do from the minute puppy comes home that will largely determine the temperament of the puppy. A good dog class teacher is a great resource for you and your family.